I don’t want my reader/riders thinking I run around naked ALL the time….I give a lot of thought to the rags I pull on. Like that universal base layer, my tee-shirt. To me, a t-shirt is a tube that delivers a message– just like television–but you put your head– not your foot– through it. Clothing historian James Laver says: “Clothing is nothing less than the furniture of the mind”. Before clothing, body decoration did the job: a memorable design had the power to impress one’s friends and enemies, as well as identify the wearer as part of a group. When you combine clothing with decorative symbols that indicate status, you get things like shirts with tiny alligators on them, heinously ugly bags with meaningful initials, and a hundred different “brands” of otherwise identical blue jeans. In fashionable circles it is critical to flash wearable signs of wealth so “sorting” (people) is easier. After all, you can’t park your Beamer inside restaurants and other public places. Furniture-wise, the t-shirt is the folding camp chair of the mind. Comfy, sturdy, portable. So indispensable, you don’t leave home without one. Your sweetheart’s slightly used shirt makes a great perfumed pillowcase for those long, out-of-town trips. They began humbly enough: a knitted cotton undergarment that went unnoticed for years –clothes can’t talk unless they show–then broke free (reputedly in Rebel Without a Cause) to proclaim: Watch This Space! It didn’t take long for the makers of cigarettes, automobiles, kid’s toys– anything and everything– to realize what humans have known for millennia: we advertise who we are via ”threadspeak”. Still, the t-shirt’s the antidote to hype. First there’s the fact that you chose a t-shirt over, say, a silk blouse or a Brook’s Brothers long sleeve. (Message: “I intend to be comfortable” except in Colorado where it says “I don’t care if I freeze a little on the descents”). Then there is what is screened on the shirt, stamping a message upon a message. Recently sighted: “B.U.M”. (=”I am anything but” ) “The one who dies with the most toys, etc”. “Team Betty” . “Chanel”. Folks that wear a logo-less t-shirt (usually sporting a slightly baggy breast pocket) cannot avoid stating a message anyway: “I despise clutter”. Graphics as well as words vie for our attention: the horizontal stripes on a cigarette model’s perky t-shirt suggest that young girls to pick up a Newport menthol to stay thin. A well-done tie-dye is worth a thousand articulate“wow!s”. Shredded, chewed-up shirts are witness to a rider’s reckless abandon, or calculated gnarliness, depending on who did the shredding: the local manzanita shrubs or the wearer. T-shirts insist that you gaze. There are small risks. One reads the message even if it means getting caught staring at the chest of an innocent bystander. If you’re the moody type, consider the layered look so you don’t confuse people with mismatched sartorial & facial signals. Why be limited to the truth about what you own and how you spend your free time? Thanks to the huge variety of status t-shirts available today, you can lie about the car you drive, the school you went to, and the outdoor gear you play with. Useful when trading up socially, dangerous when using it to apply for jobs. Clothes occupy mindspace, and your brain probably can’t quite shut its overstuffed middle drawer for all the t-shirts. An active human, no matter how much they sweat and tumble and slide, tends to build up enormous stockpiles of them. Whereas the good designs are treasured for years, enhanced by splashes of blood, mud and spaghetti, a poorly-drawn design condemns a shirt to a nasty, brutish, and usually short life as a polishing rag. Race shirts are almost always terrible, and I once saw a schwag T-shirt handed out at a bike industry party get immediately put to use as a bike cleaning rag. Barely sixty seconds elapsed between the time the fellow (call him Turbo) sized up the shirt, then conscripted it for scrub duty. Turbo was conveying, through the subtle use of body language, the message that “boy, this artwork stinks”. A hush fell momentarily, but talk resumed when it was discovered that the offending rag was in fact a blend of 50-50 cotton/ polyester, a wishy washy excuse for fabric if there ever was one. The underlying message from the producer of dreck to the luckless recipient is “well, we did spare some expense”. Ironically, 50/50s supposedly last longer and shrink less, but who cares? They’re so thin you can read through ‘em, and “cheap” is written all over them in invisible ink. Chainring marks and grease streaks actually add interest, like the telltale pro marks on your right calf. A shirt of hundred percent cotton indicates a commitment. Face it, they can’t make cotton in the laboratory yet. It still has to grown, picked, traded on the stock market, combed, knitted, bootlegged, shipped… add a buck for each operation. Usually the ten or more sponsors listed on the back of the shirt bear this expense. Thus a blank-backed, or art-covered back in addition to a frontal design means you, the buyer, pay. Or the t-shirt maker is a starving artist, and the shirt is affordable, like our local handmade airbrushed designs. Mass-produced or one-offers, they’re finite, and chances are, the damn things will become collectable. Oops they have. New York Times had a story about it…maybe I can haul it up…. The problem is, unlike collectibles like teacups and coins, shirts are prone to mildew under dark, damp conditions. If anyone felt like saving a few great ones, they would probably have to go the route of the overserious comic book collector: “wash your hands before touching! Wrap in poly bags! Season carefully for two hours in a warm oven!” Whoops, I know that poly bags destroy fabric. Read it somewhere. Please store your Grateful Dead tee’s in a cloth sack, in the dark! You can throw in a luminous plastic necklace to keep it company. If you follow my heed, the end of the line doesn’t have to be in the rag bin or the austere collection. Simply cut a 14” square out of your favorite thirty shirts, add a backing and borders, and you get a her-(or his)Story Quilt. Flaunt your wealth of experience. Nothing’s cooler than one’s own seamy narrative about Life in The Fat Lane, beginning at square one. ~ by jacquiephelan on December 19, 2007. T-shirts are also historical landmarks, identifying a point in time and space. For some of us, I assume there is a public cry for acceptance as well, to show the world that we’ve been somewhere important or hip or meaningful; therefor, we must also be as well. Ah JP, this must be the time of year where we all contemplate our clothing. I was just lamenting how damn many t-shirts I have but of course, I’m part of the problem. And in this modern world with it’s interwebs anyone with a laptop and an idea and the most minimal of skills can recall that freedom of the press belongs to those that own the press (or can at least lease time on those on demand ink-printers. But still the kids are out there with their silk-screens, modding shirts from thrift stores and that makes me happy. Manifestos with a very high rag-content. On second thought, I think I’ll save on paper towels use all those old GD shirts as rags! Jacquie, in a previous life I was creating the clothing for team@internet. That’s a long story, and it appears that time has taken its toll and the website is no longer active. It still is a hotlink on bikelane.com, just four slots above the Wombats. Whatever. Most of the clothing I had made was lycra, but I did get into t-shirts, using the cyclist we created in the pre graphics days of the internet. I am sending you one for Christmas, and have plenty more where it comes from. I stop reading when you say you don’t run naked ALL the time. I’ve been cheated all this time. 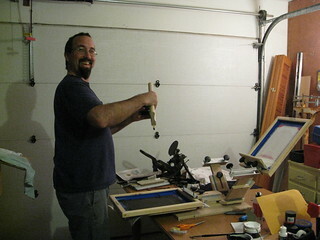 I just got a tee-shirt press and started making some shirts again. Oh my. Do I have too many t-shirts! You story reminded me of the NORBA nationals in MI in the mid 90’s. My friend was racing the downhill and had put a rather large sticker through his spokes on the front wheel. When we stopped at a particular component manufacturers tent, they saw that sticker and he was asked to wear a free t-shirt with that companies logo on it if they gave it to him for free. He said okay. Unfortunately for that shirt, it didn’t rule as much as the Wald one he already had. Guess which one was worn? ?